No-one likes to take risks with their funds, but what if you could try an alternative, competitively priced product that had already proved itself many times over? Killeshal Precast Concrete’s bus stop kerbs are manufactured with the world’s most commonly used profile as originally used in Germany. What this means is that KPC can provide bus stop kerbs that already have a proven track record. At KPC we have been manufacturing bus stop kerbs for years. 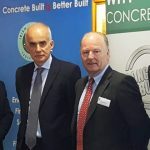 The profile we manufacture is the same profile that has been used extensively by local authorities across the UK and Ireland and throughout continental Europe… and with good reason. Pictured above is a recent installation of bus stop kerbs from KPC as replacements at an existing bus stop in Poole, Dorset. KPC’s Bus Stop Kerbs comply with the standard EN 1340:2003 and the design provides an excellent docking bay for buses, allowing the driver to easily align the bus with the kerb-line. The curved profile means that as the bus tyres meet the kerb there is a reduced risk of impact damage to tyres, wheels and shocks, and the bus tyre will only ride up the kerb profile briefly before being guided back to rest, parallel with the kerb. The increased height of the kerb then provides a platform closer to the level of the bus floor. 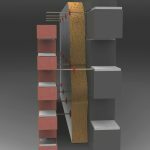 This, along with the reduced horizontal gap and the textured top surface of the kerb, produce a bus stop platform that maximises safety for all, whether they be able-bodied, vision-impaired or mobility-impaired. 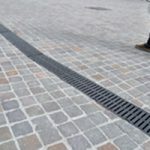 If you’re installing to a particularly distinctive area we have you covered; in addition to our standard concrete finish we also offer our bus stop kerbs in beautiful reconstituted granite, in either buff or white colouring.